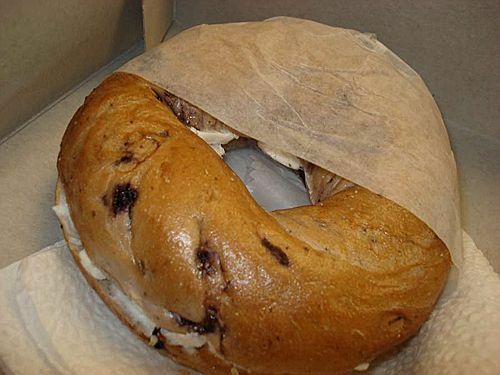 The one thing that I was most excited about before going to New York was to have Blueberry Bagels again. When I lived here 4 years ago I had it several times every week. Dunkin Donut’s Blueberry Bagels with Creme Cheese and Chocolate Milk to that. My obsession even made my boyfriend-to-be go around the whole London town without finding any and as a result he tried to make his own! Difficult, but I got so impressed! First morning I got here I went in to the DD shop and I honestly got so sad when I realised they are not doing them anymore. A couple of days later my friend Alexis tried to cheer me up by taking me to Tompkins Square Bagels (165 Ave. A) since she thought they def. had the Blueberry treats there. “They have eeeeverything” They did, (even Cookie Dough Bagels!!) except for mine favourite. I actually tried a Poppy Seeds with Blueberry Creme Cheese but it wasn’t the same.